Realising there’s no way I can match the length and quality of the last couple of race reports I’ve decided to keep this one relatively short and hopefully sweet. The race, part of the Alwinton country show, was advertised as 3 miles but actually came out as 2.5m on my Garmin. A fine drizzle descended as the pack of runners set off, and the first mile led us across farmer’s fields interspersed with several gates and fences. So far, so good. But then we hit the first ascent, a short steep climb of about 30 metres. “F***, that was tough!” I thought after reaching the top, but then the second ascent came into view, a seemingly endless climb disappearing into the clouds above us, and the harsh reality suddenly hit home that the first hill was merely a tease. By now the drizzle has developed into a fine rain (you know the sort) and the ground underfoot was beginning to cut up in the wet conditions. The Alwinton countryside is by all accounts stunning, but trudging up the hill in single file, my view consisted of a pair of thick-set legs from the runner in front who was doing a grand job of sheltering me from the rain. Eight very long minutes later (and a climb of about 400 metres) we eventually hit the peak and run along the ridge until we reach the point where the route took runners downhill. Hallelujah! 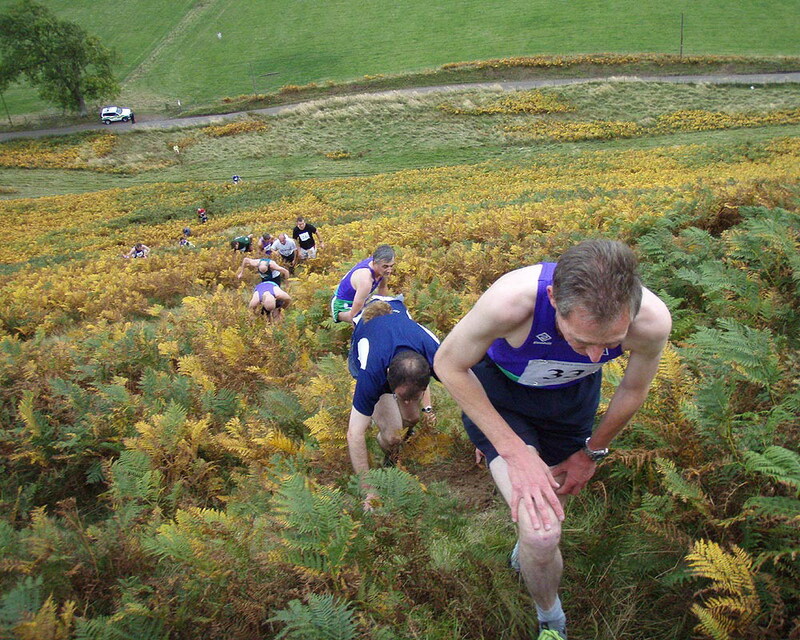 Compared to the ascent, the run down hill is over in a flash, and we’re soon back into the farmer’s field heading back to the start/finish line. What began as drizzle and turned into fine rain was now a torrential downpour, and as a final sting in the tail, runners had to run through a fast flowing stream merely metres from the finish line. Despite being soaked to the skin everyone was justifiably jubilant after a challenging race and I’d heartily recommend doing it next year. Entry to the country show was £7 but this included your race entry fee. Nice report DD, definitely a race on my to do list! And well done to Douglas for 9th place!